Armchair Adventure: The Adventure Cycling Association has graciously provided Century Cycles with back issues of their magazine, Adventure Cycling, to hand out for FREE at our three stores. 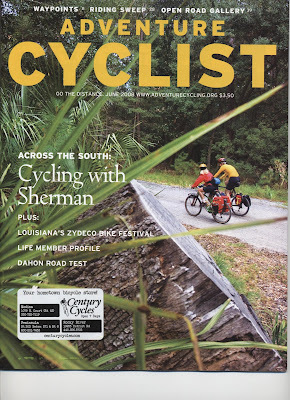 I'm currently reading that cover story from the above June issue called "Cycling Sherman's March," a pretty good read for bicycling-inclined Civil War buffs. Baby Bulletin: Rocky River staffer Neil Adams has just become a grandfather for the very first time! Neil and his wife Sandi are the proud grandparents of Hayden Michelle Schron, born on October 3. Congratulations, Adams/Schron families! Cycling Colorado: The front page of yesterday's Travel section of The New York Times featured an extensive article called "Biking Colorado's Wine Country." Reporter Stefani Jackenthal writes, "In recent years, the vineyards here have produced award-winning varietals and blends, making Colorado a rising star in the wine-making universe. More important, it’s given active travelers yet another reason to visit this outdoorsy state, a place where you can push yourself to the physical limit by day, and then relax with a good meal (and an even better glass of wine) at night." Watch out for the marching band! Our favorite customer from Alaska checks in! Define your life...at the Arc de Triomphe!